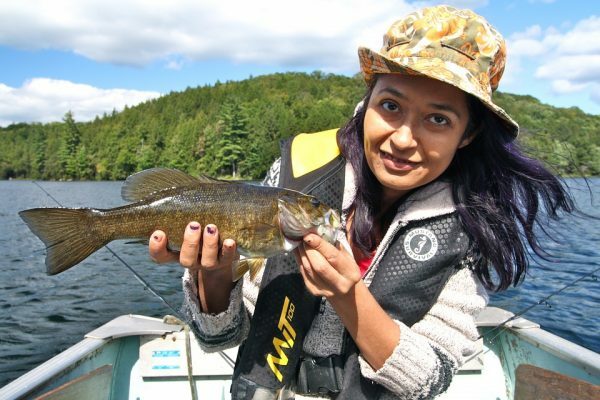 When the waters turn cold, smallmouth tend to be the main target for bass anglers. If the lakes haven’t iced over just yet, meaning there’s still some time to take advantage of the smallmouth bite in your neck of the woods. What do you do when the tubes, grubs and drop-shot rigs aren’t getting the job done? Instead of calling it a day, it’s better to bring along a few swimbaits, which can be absolutely deadly on cold weather smallmouth. Here are 3 tips to help you stay ahead of the curve when using swimbaits for smallmouth when the waters get cold. The best time to toss a swimbait is when the water temperature drops between 45 and 55 degrees. This is when smallmouth will start to gorge themselves on bait as they prep for winter. Swimbaits can do the trick when other baits can’t because of the way their tails move the water around, especially when you’re fishing around sand. Make longer casts to cover more water and make sure to get that swimbait pretty close to your target, as the colder temperatures will keep the smallies from chasing too far. In the colder seasons you’ll want to use a bigger swimbait model, like in the a 4 ½ inch range. Then, work that monster along the bottom to get it banging off rocks and churning up a ton of sand. Swimbaits with a perch pattern work well in colder waters, but I’d also keep some green pumpkin on-hand, too. The green pumpkin does a great job of imitating a goby, which is one of the primary smallmouth prey. Bonus Tip: Use a jighead with a football head to get through the rocks and sand a little easier. During the fall, smallmouth will hold up on the bottom. That’s not an exaggeration; they’ll literally lay with their bellies on the bottom of the lake and suspend there. Use your electronics to see how these fish are relating to structure along the bottom. When you find schools of smallmouth, cast your swimbait past them and pull it right through the thick of it. What’s important to keep in mind, too, is that it’s not uncommon for your swimbait to draw strikes during its descent to the bottom. If you feel a bite during the fall, though, you’ve only got a few seconds to set the hook.